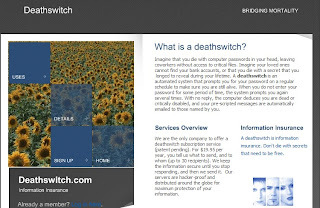 Death Switch is an interesting web service, that keeps your personal internet information till you died, after you death it will send your data to your family, co-work,or close friend, they can know how to enter your internet account. Sounds crazy but it is a pretty cool idea, I think. It will make a regular schedule to make sure you are still alive, after system several prompts if you did not reply, it will send a message to someone who you trusted. But it is not a free service, that costs $19.95 a year.